If you're wondering where I've been lately, I've been too busy snorgling my new puppeh to get up as many posts as I should be! But really, can you blame me? I mean, just look at this face! Aww, what a tiny ball of adorable pathetic-ness! 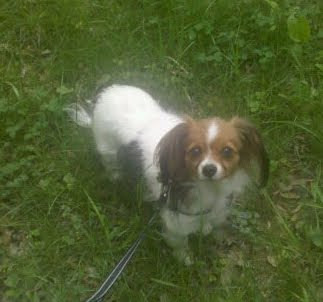 Her name is Kyoko and she's a Phalene, which is a drop-eared Papillon. She's almost three, but I will probably always call he a puppy, and weighs a mere 7.5 lbs. I want to clarify right now that I will never ever treat my dog as a fashion accessory, she is a beloved pet and not something that will complete my outfit. But... well as a shopaholic I just have to check out all the fun designer pet accessories out there! I was a little surprised at the lack of fashion house pet lines. Even with the economic downturn you know people compulsively spoil their pets and designer doggie goods are pretty big business! In fact I think a successful brand growth should go something like this: Ready To Wear Line, Accessories & Beauty, Store Collaboration, Diffusion Line, Pet Collection, Kids' Clothing, Housewares. Listen up designers, you'll probably make more money making pet accessories than kids' clothing! Think about it, would you rather spend $100 on a pet carrier you can use forever, or a diaper bag that will get maybe a few years use out of before being given to a friend or sold on eBay? 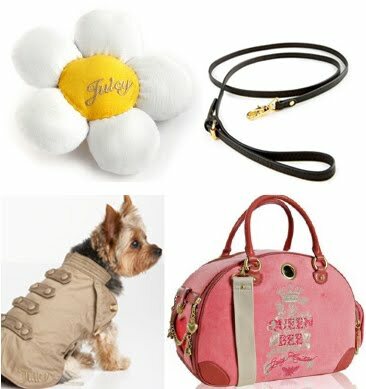 Juicy Couture has a large good selection of dog gear, lots of clothing if you're into that and some chew toys. I really like the uptown leash, though their site is sold out of the matching collar. But you can find plenty of their items, including very pink, slogan emblazoned dog carriers, all over the internet. 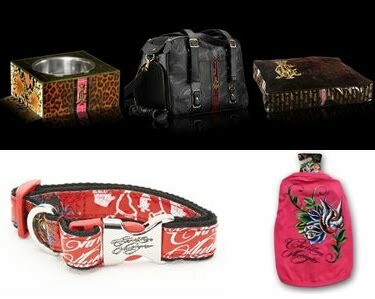 For a similar look, I know Christian Audigier did do dog accessories at one point, I found some pieces including carriers, harnesses, beds, bowls and more at Five Star Fido. Another brand with a dog collection is Ralph Lauren, but they're limited to tiny polos. Cute but you'd think they'd have some preppy collars, bowls and beds as well! And whatever happened to Coach - I know they used to have collars and leashes and the like that were quite chic and sophisticated looking. But I can't seem to find anything on their site... did they stop making animal accessories? For why???? 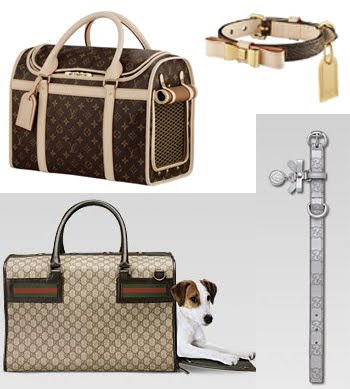 Gucci and Louis Vuitton have some more upscale dog items, and seem to focus more on functional pieces like collars, leashes and carriers. I'm not willing to spend $300 on a dog collar, but obviously some people are! I wish they had more options than everything covered in their monograms, but it doesn't really matter since I can't afford their stuff anyway! Sakes Fifth Avenue also has a section where you can buy tres overpriced Etro and Paul Smith items, as well as some other brands, including more Juicy Couture. Ok, that doggie tux shirt for $40 is pretty hilarious! 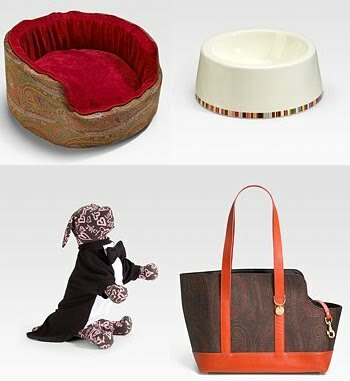 But $525 for an Etro dog carrier without any outside pockets??? Seems a bit insane to me! And that dog bed is $670 - talk about a pampered pooch! In the end I've decided to go with more affordable, dog-specific brands... at least until Marc Jacobs comes out with puppy gear ;) Do you have any recommendations for me?